Hana Kotoba is a Japanese word that means literally, "Language of the Flowers". This latest necklace has been inspired by Sei Shonagon's "The Pillow Book", or Makura no Soshi. It has been written in the Heian Era, more or less one thousand years ago, in XIth Century Japan. About its author, we know little. We know however that she was a lady-in-waiting in the court of the Empress Sadako, and this book can be read like a diary. It's very enjoyable, and memorable. 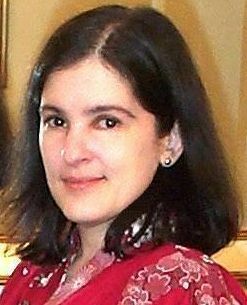 Her description of people, clothes and nature is very vivid and funny at times, and I really enjoy her "lists" (like "Hateful Things" or "Depressing Things", "Splendid Things" and even "Things That Give a Pathetic Impression"!). It is a delightful book, and everybody should read it at least once. Or indeed, have it under the pillow for a quick browse before sleeping at night, or in one of those rainy days when the only thing you need is a fluffy pillow and a good reading! "Things that cannot be compared: Summer and Winter. Night and day. Rain and sunshine. Youth and age. A person's laughter and his anger. Black and white. Love and hatred. The little indigo plant and the great philodendron. Rain and mist." 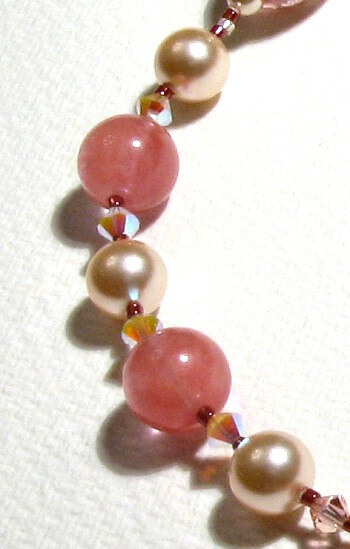 - One silver-plated Swarovski clasp for two strings. 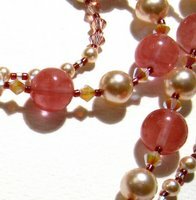 The necklace is a double one, this is why I used a double-string clasp. 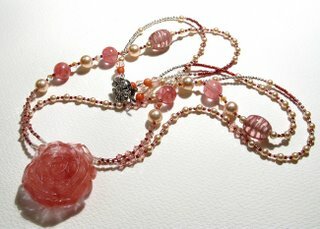 Double necklaces are not very easy to make (depending on the design of your piece and materials used, of course). 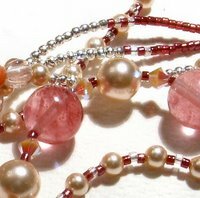 For example, this one was a bit like making four different necklaces due to the central bead that had to be locked in place first and then having the rest of the beads strung around it. It took me more than four hours just to string it, not to mention the design phase. Detail of the carved quartz rose, very pretty and translucent. 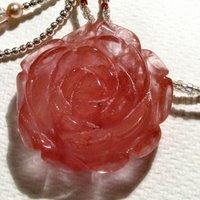 I would describe the colour as "watermelon" rose, rather than "cherry". Diameter is approximately 35mm. 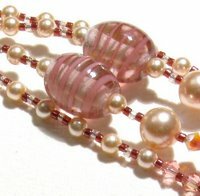 The 2nd picture shows the lovely oval Chinese lampwork beads with pink swirls, along with some of the Swarovski pearls and Miyuki Delicas. 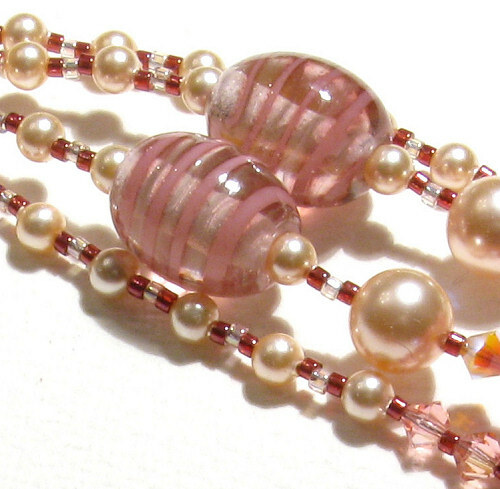 Two detailed shots of the cherry quartz round beads, which are very smooth and have a lovely transparency to them. 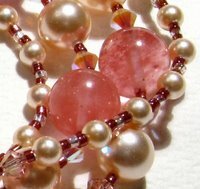 We can also see some of the Swarovski pearls and Rose Water Opal AB bicones, which look slightly yellowish in the pictures but not as much in real life. The tiny silver-plated spacers and Miyukis are also visible here. One of the reasons this necklace was a bit harder to complete is the size of the Delicas: they are indeed very tiny and sometimes it is hard to string them (I am short-sighted and have not much sense of depth left in my right eye, so...). Two more detailed shots of the Swarovski elements, cherry quartz beads (yeah, I love them!) 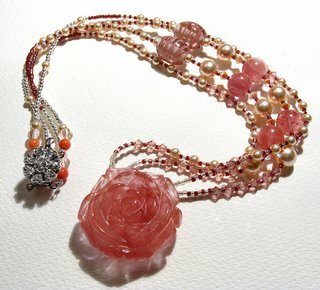 and Miyuki Delicas (pretty but hard to work with!). 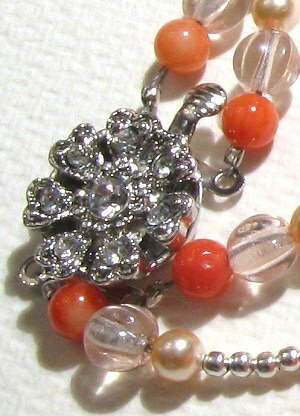 The 3rd picture shows the Swarovski clasp in detail, a flower with crystals embedded. The two hooks for the double strings can be seen here. Again, it is a very safe clasp, ideal for this kind of ornate jewel. It would not go well with other materials and styles, but if the piece is a bit more "baroque" and intricate, then it's ideal!